Be the first to share your favorite memory, photo or story of Dorri Joy. This memorial page is dedicated for family, friends and future generations to celebrate the life of their loved one. Dorri Joy Millender Wallace, age 58, of Bluebank Road, Morehead, passed away Thursday, January 10, 2019, at the U. K. Medical Center in Lexington. Born November 9, 1960, in Akron, Ohio, she was the daughter of the late L. D. Millender and Cilistene Williams Millender. Besides her parents, she was preceded in death by one sister, DuWanna Millender. Dorri is survived by her husband, Jimmy F. Wallace, of Morehead, whom she married August 14, 2012; one daughter, Klaireesta Jackson; one son, Kenneth Jackson; one sister, Latasha Glover Portis; and one brother, Deshawn Glover, all of Akron, Ohio. Dorri was a social worker for Pathways in Morehead and Mount Sterling. She enjoyed arts and crafts, sewing, painting, and making soaps and oils. She also enjoyed the outdoors, camping, and bonfires. Dorri was greatly loved and will be missed by all. To send flowers or a remembrance gift to the family of Dorri Joy Millender Wallace, please visit our Tribute Store. 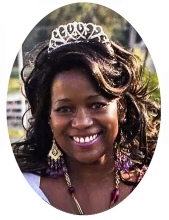 "Email Address" would like to share the life celebration of Dorri Joy Millender Wallace. Click on the "link" to go to share a favorite memory or leave a condolence message for the family.